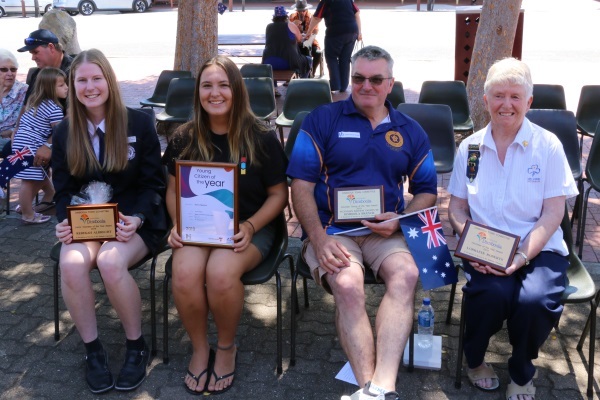 A large crowd of around 100 people assembled in the forecourt of the Old Shire Hall on Saturday morning to celebrate Australia Day and to witness the presentation of the annual Town Committee volunteer awards. The proceedings were introduced by Margaret Menzel, President of the local Country Women’s Association (CWA), who was followed by Welcome to Country by Aunty Nancy Harrison, and addresses by Mayor Cr Ron Ismay, Australia Day ambassador Alice Pung and the 2019 Dimboola Memorial Secodary College captains, Rebekah Albrecht and Mitch Jorgensen. The highlight was the announcement by Mayor Ismay of the Hindmarsh Shire Young Citizen of the Year award which went to Dimboola’s Danni Haebich, whilst Annette Creek of Nhill was recognised as the Citizen of the Year and the Nhill Lutheran Church Christmas Tree Exhibition was awarded the Community Event of the Year. The Dimboola Town Committee awards were presented by Sharon Cook and went to Rebekah Albrecht, Lorraine Roberts and the VRI Social Club, which was represented by Paul Sanders. Above - The 2019 Dimboola Australia Day award recipients - Rebekah Albrecht, Danni Haebich, Paul Sander on behalf of the VRI Social Club and Lorraine Roberts. Award recipient biographies supplied by the Dimboola Town Committee and Hindmarsh Shire. Rebekah is a wonderful example of a young person who always strives to give their best and to make a difference in the lives of others. Premier’s Spirit of Anzac Prize, which involved a trip to Darwin and Singapore with a group of other Victorian students. Was a participant in the Bayerische Jugendring (BJR) German Exchange program. Is currently a member of the Hindmarsh Shire Youth Council, an role in which she continued from 2018.
the Order of Australia Association Hindmarsh Branch Student Citizenship Award. Rebekah is also one the Memorial College Captains for 2019. Rebekah is a courteous and studious individual whose academic results reflect the hard work and commitment that she devotes to her school work. She is always willing to stand up for someone, when she believes that they have been wronged and is passionate about protecting the environment. In her spare time, Rebekah plays hockey for the Dimboola Hockey Club during winter and has assisted with umpiring the Minkey hockey games for young primary students. She has also volunteered to umpire junior matches on Saturdays and represented the Wimmera Hockey Association at Junior Country Week in previous years. Rebekah is a role model to her peers and the younger students within the Hindmarsh Shire, and a worthy recipient of the Junior Volunteer Award. Lorraine has had an outstanding association with Girl Guides in Dimboola, teaching and helping many generations of young girls. She herself started as a Brownie in 1958 in Dimboola which led her to progress on to Guides, and at the young age of 18 became a warrant leader. After having her two children, Lorraine returned to Guiding full time as an assistant Brownie leader. In 1981 she gained her warrant and became Brown Owl. Lorraine became a Pack Holiday tester and over the years attended and ran many camp holidays, including ‘Camp Together’ at Britannia Park with over 1,000 girls from all around Victoria, and local events at Arura and around the Wimmera. In 2010 she attended an international camp in Geelong with 2,500 Guides and Leaders from Australia and around the world. In 1999 Lorraine received a State Banksia Award for outstanding service in Guiding to the Dimboola and Wimmera Region Guides. In 2007 Lorraine received her 40 years award and also a Blossom award from the State Commissioner. In November last year Lorraine received her 50 year service award - an amazing achievement! For the past 31 years has been helping with the running of the Gateway Shop, decorating windows with amazing displays. Lorraine is involved with FOSH - Friends of Sovereign Hill - where she works as a volunteer for a couple of days each month. This involves dressing up in 1950s dress and participating in may varied activities and talks. She has also attended the hospital, Allambi and schools with her wonderful costumes. Lorraine is a wonderful and worthy recipient of the Dimboola Town Committee Australia Day Award. The Victorian Railway introduced the Victoria Railway Institute (VRI) across the state of Victoria where railway depots were situated, and committees were formed. The Dimboola committee was formed in 1936 and the hall was built in 1940. The hall has a steeped railway history and has been used for many functions over the yeas by railway employees, and the wider community. Many dances, birthdays and parties have been held there. After privatisation of the railway s and many changes in the railway industry, the Dimboola VRI went into recess in 1996. The Dimboola Primary School leased the hall for many years for assemblies, school plays and other activities but due to the dwindling number of students they had no further use for the hall. After making enquiries about he hall, a band of volunteers learned that it sits on crown land (Victrack) leased by the VRI and if it continues to be unused, would be demolished at a great cost and a part of Dimboola’s history lost. The group approached the VRI and made a deal to form a committee of 15 members which would enable them to save the hall from demolition. Currently there are 40 members. The hall was in very poor condition, so the dedicated group set to work to repair the neglected building. Money was donated by various groups, including Bendigo Bank, Cropping group, Town Committee, VRI and Hindmarsh Shire. The hall is now at the stage where functions can be held, and the committee have had a dinner in the hall and use it to socialise. Work will start shortly on the outside and new fencing will be erected. A lot of memorabilia has been donated and is being displayed around the hall. The committee should feel very proud to have saved this significant piece of history for our town and should be commended on their foresight and dedication. Along with the Young Citizen of the Year award to Danni Haebich, the following Hindmarsh Shire awards were announced later in the day at Nhill. Since relocating to Nhill in 2000, Annette has become a passionate resident and has had an immeasurable impact on the broader community of Nhill and District. Annette was appointed Executive Officer of Nhill Neighbourhood House Learning Centre in 2014 and since then has overseen the organisation to become one of the region’s leading community education service providers. During Annette’s tenure as Executive Officer, Nhill Neighbourhood House Learning Centre has received recognition by being the recipient of numerous State and Regional awards. In 2018 Nhill Neighbourhood House Learning Centre was a finalist in the Wimmera Business Awards – Best Community Service Organisation category while Paw Po was the recipient of the Best New Business Award. In 2008 Annette was instrumental in the establishment of the Nhill Men’s Shed and as continued to be a strong advocate for the organisation. Hindmarsh Shire Council Mayor, Cr Ron Ismay said “In addition to all the other work Annette has done during her time in Nhill, her passion for Nhill and the region’s Karen community has stood out. “She has established Nhill Neighbourhood House Learning Centre as a leading service provider through language classes (English and Karen), settlement services, the establishment of Paw Po for the Karen women and more recently The Patch through the Growing Hindmarsh Together project”. Cr Ismay added, “Annette was the driving force behind Nhill Neighbourhood House Learning Centre recently being the recipient of funding through the Victorian Government to develop the Wimmera CALD – Workforce Industry Partnership. This project has enabled the creation of two positions to assist local employers and CALD employees gain employment”. “On behalf of Council I congratulate Annette as a very deserving recipient of the Hindmarsh Shire Council 2019 Australia Day Citizen of the Year Award”, concluded Cr Ismay. “There are two Nhill women whose commitment for twenty years has ensured the broader Nhill community celebrates Christmas each year. On behalf of Hindmarsh Shire Council, I have pleasure in announcing the Nhill Lutheran Church Christmas Tree Exhibition and in particular Mrs. Lorraine Janetzki and Mrs. Wendy Sherwell as the recipient of the Community Event of the Year”, said Cr Ron Ismay. From humble beginnings this event now attracts displays from a broad range of individuals as well as community groups and other organisations including, Avonlea Home for the Aged, Cooinda Day Centre, Nhill Churches and Sunday Schools. Cr Ismay said, “The dedication shown by Lorraine Janetzki and Wendy Sherwell towards this event is outstanding and I am sure I speak for all Nhill residents when I say that their commitment and vision has bought joy and a smile to many people over twenty years”. ‘On behalf of Council, I congratulate the Nhill Lutheran Church Christmas Tree Exhibition as a very worthy recipient of the Community Event of the Year’’, “Hindmarsh Shire Council sincerely thanks everyone who took the time to submit nominations for the 2019 Australia Day Awards and congratulates everyone on their nominations across all categories” added Cr Ismay.